IIFA 2017 finally kick-started yesterday at Met Life Stadium in New York. The star-studded event witnessed who’s who of the B-town in presence. 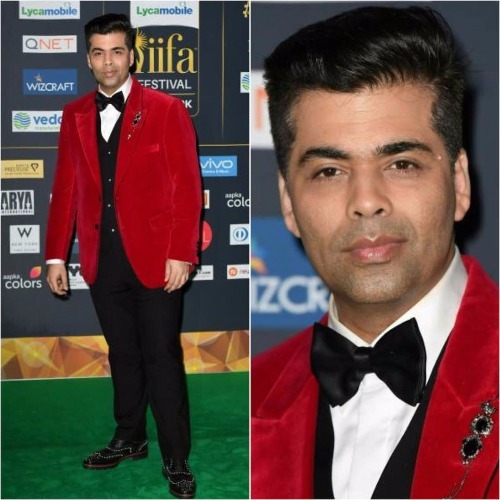 From Salman Khan to Sushant Singh Rajput, Karan Johar, Saif Ali Khan, Kalki Koechlin, Kriti Sanon among others turned heads in their best stylish appearance as the green carpet enrolled last night. While Katrina Kaif, Huma Qureshi, Neha Dhupiaand Taapsee Pannu were among the worst dressed at IIFA 2017. Shahid Kapoor: Shahid Kapoor made a dapper appearance in a suave white ensemble with black shoes finished out his look. 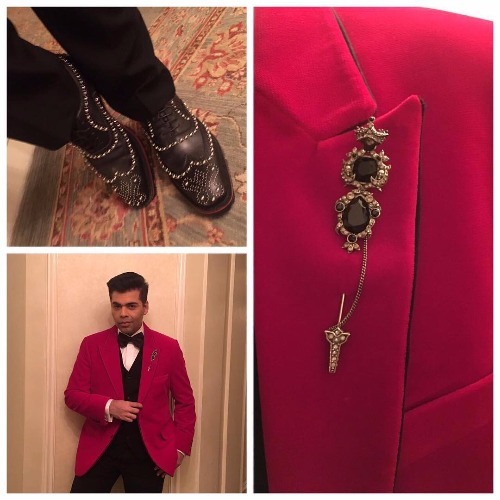 Karan Johar: Karan Johar opted to pair his black and white separates with a velvet red blazer featuring Alexander McQueen lapel pin. 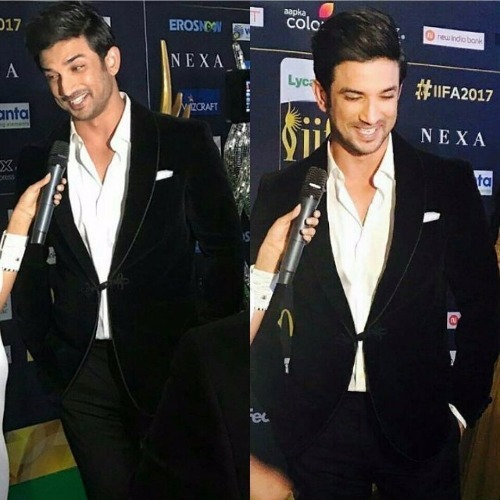 Sushant Singh Rajput: Sushant Singh Rajput picked a velvet blazer in combination to his black and white formal look. 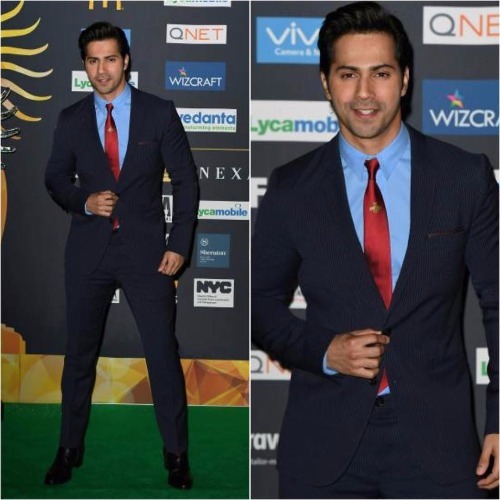 Varun Dhawan: Varun surely knows how to do it in style. The actor walked the carpet in Paul Smith suit, Emporio Armani shirt, Gucci tie and Saint Laurent boots. Hhmm,leaving female fans to go weak in knees. Saif Ali Khan: Saif chose to go navy in his Brooks Brothers suit paired with a Hugo Boss shirt and Tom Ford tie. Damn, hot! 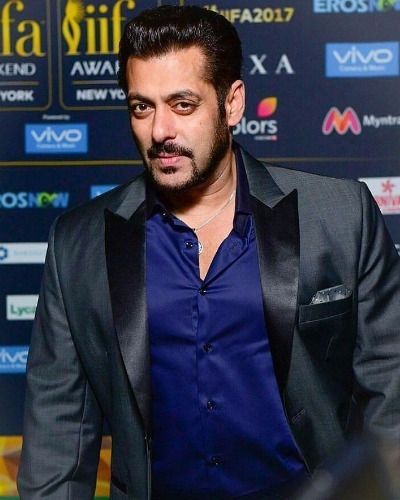 Salman Khan: The Dabangg stud always play safe. He chose simple blue shirt and a black coat with a satin edge. Divya Khosla Kumar: Divya Khosla Kumar, chose to go desi by picking an Anju Modi dress for her green carpet appearance. She finished out her look with hair slicked back and eye-grabbing maangtika from Amrapali. Richa Chadha: Wearing a ruffle-detailed gown featuring thigh high slit, Richa walked the green carpet in her best stylish appearance. However, more than her outfit, we loved her neck piece and hairdo. Disha Patani: Disha Patani was seen in a shimmery Zara Umrigar mini dress, which we think was not the right pick for such a grand event. However, messy hair and the winged eye were on point, which upped her style quotient. Huma Qureshi: Huma made her green carpet appearance in a Prabal Gurung strapless gown that she wore with a pair of Gianvito Rossi pumps. 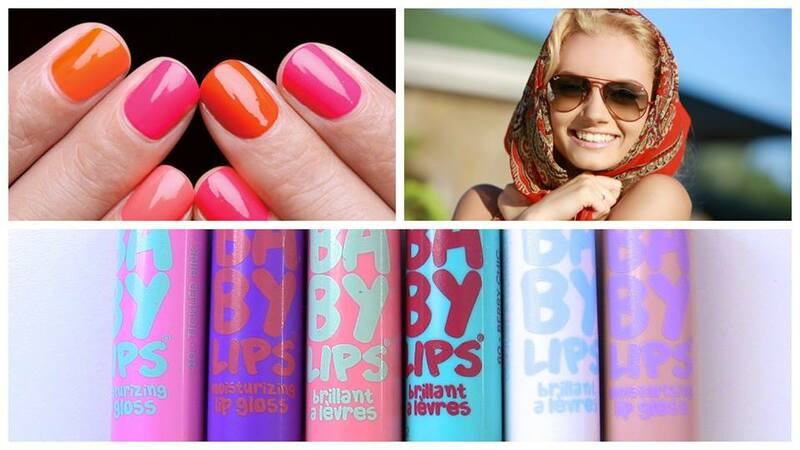 The hot pink lip just completed her look at perfect. 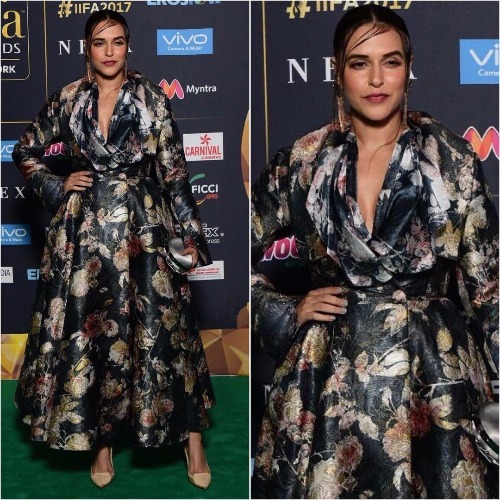 Neha Dhupia: We wonder what has gone wrong with her fashion taste. Neha picked Hemant and Nandita printed floral dress, which was surely not the right choice for green carpet appearance.Nevertheless, we loved her risky attitude and confidence. 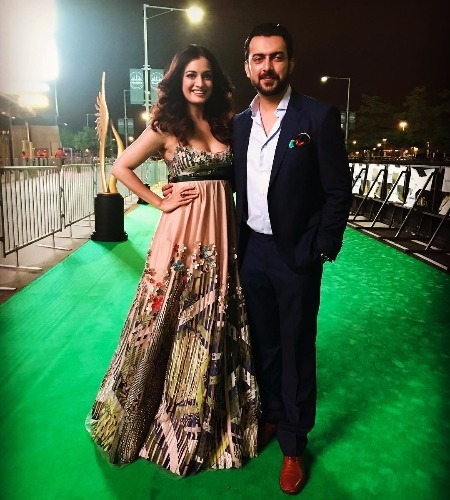 Dia Mirza: Dia has never failed to amaze us with her style statement and this time again; the actress rocked her pretty look in Geisha Designs dress. Natural hairdo, big earrings, and glossy lip rounded up her look. Alia Bhatt: Wearing Indian wear for the red carpet appearance is not what Bollywood actresses would choose for. But Alia picked Indian-wear by Manish Malhotra for the green carpet appearance and she nailed it. The Udta Punjab actress finished out the look with dewy make-up and big earrings. Katrina Kaif: Hot AF! Katrina was spotted wearing Abu Jani Sandeep Khosla Indo-western outfit with wavy side-swept hair, uncut diamond jewelry and a striking red lip finished out her look. Kriti Sanon: Raabta actress Kriti looked absolutely doll alike in Mark Bumgarner dress. She finished out her look with Aurelle jewellery. Kalki Koechlin: Kalki picked traditional Indian wear designer Sabyasachi saree. The twist to an attire was cape styled jacket. We are not sure if it was thumps-up or not. We leave it to you to decide. Stay tuned with us, we will get more IIFA 2017 updates. Previous : Body Shaming: Deepika Padukone Gets Trolled On Instagram For Being Too Skinny! Next : IIFA 2017 Full Winners List: Alia Bhatt, Disha Patani Win Big, Neerja Becomes Best Film Of The Year!